Governorship Candidate of the All Progressives Congress (APC) in Imo State Senator Hope Uzodinma has stated that the Governor of Imo State, Rochas Okorocha should hide his face in shame for failing to install his son in-law as governor of state. This is just as he added that Okorocha is dead politically. The Senator, who said this in a statement in Abuja, today said Okorocha should hide his face in shame instead of blaming him and the National leadership of the party for his failed attempt to install his son in-law as governor. Uzodinma advised Okorocha to apologise to the people of Imo for his misrule instead of looking for scapegoats for his failure. The Senator’s statement came on the heels of the comment by Okorocha that the APC failed to win the Imo governorship election because of the candidacy of Uzodinma. He reminded the governor that even as “a sitting governor he failed to win a senatorial election and got a Returning Officer to announce him winner under duress. 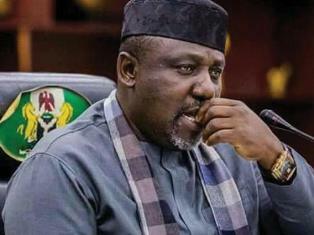 According to him, “I thought by now Okorocha should be hiding his face in shame after he lost his bid to install his son in-law and win his senatorial election. Be the first to comment on "Okorocha Should Hide His Face In Shame —Uzodinma"